One UNC philosophy professor invites us to question what we put on our plates. Approximately 4,000 to 18,000 gallons of water are needed to produce a hamburger, reports the United States Geological Survey. When people make an effort to conserve water, most take shorter showers or buy more efficient appliances. But these methods may be missing the mark. 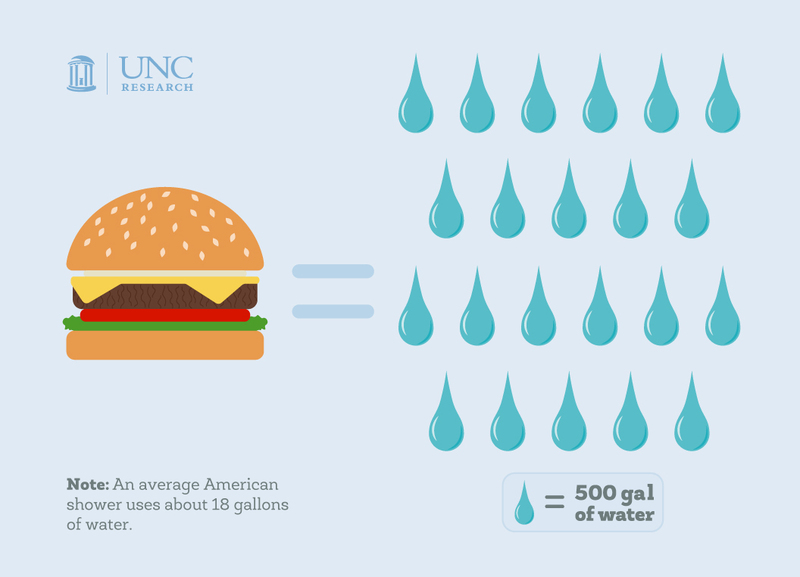 Approximately 4,000 to 18,000 gallons of water are needed to produce a hamburger, reports the United States Geological Survey. An average American shower, on the other hand, uses about 18 gallons of water. During his time as an undergraduate, Sebo studied philosophy and sociology at Texas Christian University. Eager to apply what he was learning outside of the classroom, he started two animal rights groups — one that organized movie nights and leafletting campaigns, and another that helped trap, neuter, and release feral cats. “Surprisingly, there is a great animal, environmental, and vegan community in Fort Worth,” Sebo jokes. Finding this community made Sebo eager to challenge more of his beliefs about the world. He would pose questions as a philosopher: How do animals experience the world? Do we have an obligation to not kill or eat them? And then as an activist: Should we advocate for abolition or regulation of animal use? Can civil disobedience or property destruction ever be okay? “In my little corner of philosophy, people talk about consumer ethics more than they talk about activism in general,” Sebo says. “But we need to talk about all these issues if we want to know how to make a difference in an ethical way.” So Sebo decided to expand his horizons. After graduating from TCU, he traveled to the Big Apple. He earned a doctorate in philosophy from New York University, took a job teaching animal studies and environmental studies there, and then took another job practicing bioethics at the National Institutes of Health. Fast-forward ten years, and Sebo has returned to the South to work at UNC-Chapel Hill. So far, he’s pleased with the local animal and environmental community and was delighted to hear about the university’s Food for All theme. This fall, he will help teach an interdisciplinary class on food studies. And as Associate Director of the Parr Center for Ethics, he co-organizes events that facilitate nonpartisan discussion about important ethical issues, including a fall environmental ethics workshop related to this campus-wide theme. When he’s not teaching, Sebo is co-writing a book with Christopher Schlottmann, one of his colleagues from NYU. The book, titled “Food, Animals, and the Environment: An ethical approach,” is split into two parts. The first section focuses on the impacts that food systems have on animal welfare, public health, and the environment. Sebo offers climate change as an example. Industrial animal agriculture accounts for an estimated 9 percent of carbon, 37 percent of methane, and 65 percent of nitrous oxide emissions. Add it all up, and the food that we eat contributes to climate change more than most, if not all, other industries. As Sebo notes, this is why it helps to study philosophy and challenge our assumptions about the world. For example, when people think about environmental issues, they don’t usually think about food. “People think about taking shorter showers, changing their light bulbs, driving a hybrid car, or planting a tree,” Sebo says. He argues that this kind of environmentalism will not cut it. In the second part of their book, Sebo and Schlottmann address the individuals involved in the system. “We ask what we should do with all this information,” Sebo says. By examining the ethics of food production, consumption, activism, and advocacy, the authors hope to demonstrate how connected these topics are, and encourage people to be part of the solution rather than part of the problem. Jeff Sebo is research assistant professor of philosophy and associate director of the Parr Center for Ethics. He joined the department in 2015, following positions in bioethics at the National Institutes of Health, and Animal Studies and Environmental Studies at New York University.